This page may contain affiliate links. Any commissions earned will help my website to remain free forever. (Full disclosure). 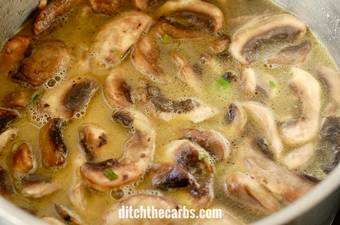 Ditch the canned soup – make your own low-carb cream of mushroom soup! If you’ve been scouring the groceries for cream of mushroom soup, then you’re in luck. 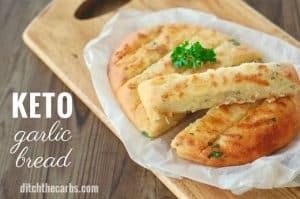 This recipe is easy to make and easy on the carbs. It’s only 5.6g net carbs per serve. Here’s how you can make the soup you love and avoid all the unnecessary carbs and ingredients in regular canned soup. We’ve all gone down the aisle where the readymade, canned soups are before and didn’t really think twice about it. We would have them for lunch or dinner alongside our favourite bread and we were satisfied with how it tasted and filled us. They were probably a staple on those winter evenings at home. Of course, that was until we realised how much of the ingredients were added wheat, added sugar and other processed nasties. Upon closer inspection of the labels, you probably were amazed at how many canned soups contain added sugar and wheat. And real cream? Not a chance. More like milk powder substitutes and the like. But hey, don’t sweat it! Luckily, there is a real, better and – most importantly – healthier way to make your own cream of mushroom soup. 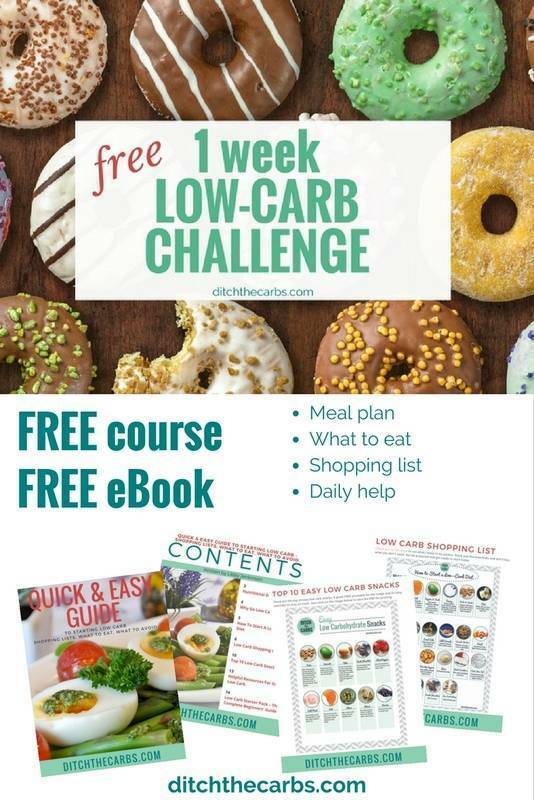 This recipe is absolutely low-carb, no-nonsense and really easy to make. I understand how much easier it is to just open a can of soup, but there are so many upsides to making it yourself. You don’t have to worry about BPA and other toxins getting in your soup because of the can itself, for example. Soups in cans can contain a lot of sodium – way more than you need! And then there are the preservatives and other additives. Need to sneak in more vegetables in your diet? 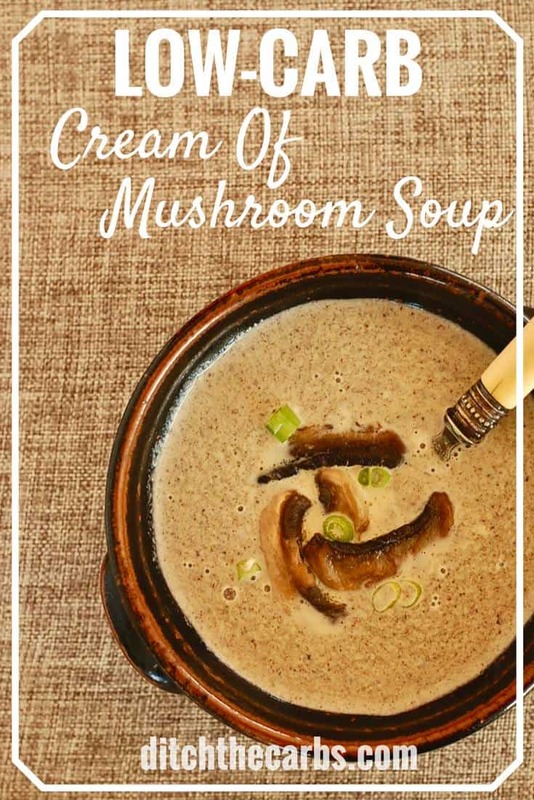 This Keto Cream of Mushroom Soup is a must try! The wonderful thing about making your own cream of mushroom soup is that it’s a great way to sneak in more vegetables in your diet. This is surely a recipe to add to your list especially when you’re getting your family to increase their intake their vegetables. Now who wouldn’t want that? You can say goodbye to those cans laced with chemicals and misleading ingredients. You just might have the ingredients for your recipe in your kitchen right now. Try this out for yourself and you’ll be glad you made the switch! 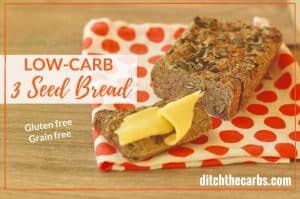 If you love toast with butter to serve along side your low-carb soup, here are my favourite low-carb bread recipes. This is the best cream of mushroom soup I’ve tried so far! Let me know if you’ve tried it too. 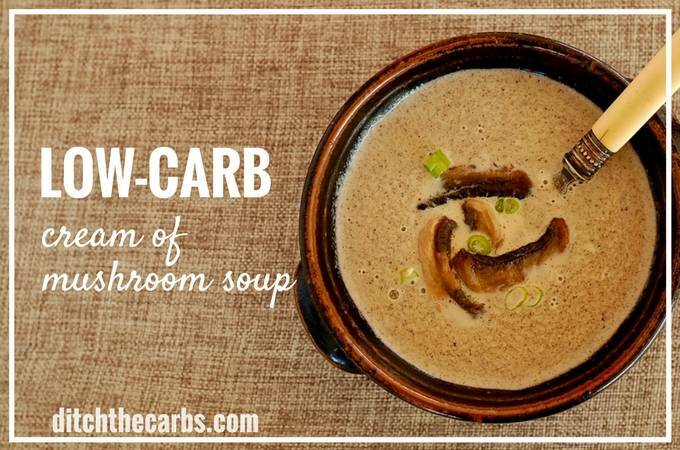 It only takes 6 simple ingredients to make this low-carb cream of mushroom soup, and it only takes 20 minutes TOTAL. 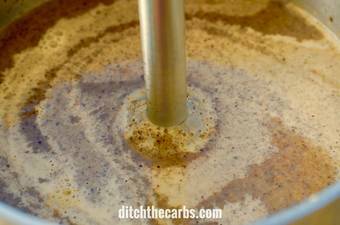 Easy healthy family recipe for low-carb cream of mushroom soup. Follow the step-by-step instructions. 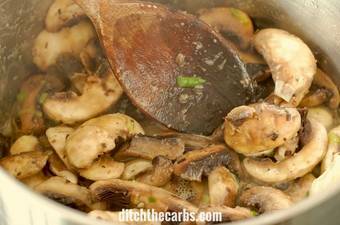 In a large saucepan, heat the butter and gently fry the onion, garlic and mushrooms until soft. Thi should take about 5 minutes. Remove the saucepan from the heat, puree until smooth using a stick blender with the blade attachment. Add the cream and gently heat again, but do not allow to boil. 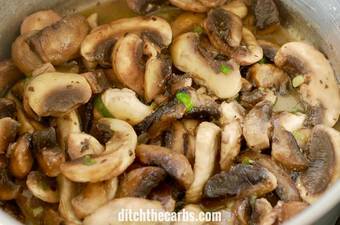 Serve with a drizzle of cream and a few mushroom slices for garnish. 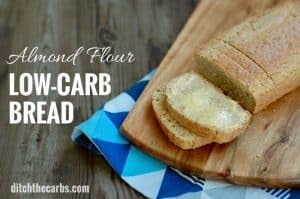 If you would love to enjoy some low-carb bread alongside, take a look at my low-carb almond flour bread recipe. 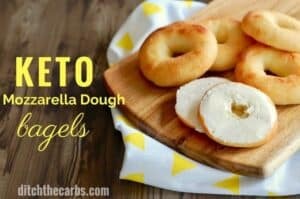 Tried this recipe?Mention @ditchthecarbs or tag #ditchthecarbs! Success! Now check your email to receive your eBook and to confirm your subscription. Portion Control – What does 30g protein look like? I made this and loved the flavor but wondered if after the blending it will always turn out somewhat “grainy” texture because of the mushrooms not blending completely smooth? I was hoping for the kind of creamy in the (terrible for you) canned cream of mushroom soup. 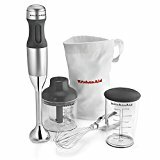 The grainy texture may be the mushrooms not completely being blended using the stick blender with the blade as you suspected. The regular canned/tinned cream of mushroom soup also has flour, or some type of thickener, which helps suspend the mushrooms (if indeed there are any in there 😉 ), some are only “mushroom flavoured” soups. At least with this recipe, you know it is jam-packed with actual mushrooms. What a superb idea! I’m sure it would work, although, with a caveat, my soup includes fresh dairy which may split when cooked for a long time in a casserole. If you try, please come back and let me know how it turned out. I was wondering the same thing. We make green bean casserole every Thanksgiving. What do you mean by splitting??? Apologies, it’s my “kiwi” terminology. When I say a soup may “split”, I actually mean it could separate or curdle. Serving sizes. Your nutritional labels will tell the amount of calories and carbs, etc per serving, but I do not see what a serving is. I have used dozens of your posted recipes (fabulous by the way) but, you do not put a serving size amount on the label. I am making the mushroom soup, it states 6 g of carbs (approx) per serving, what is a serving for those 6 grams? I count all of my carbs every day – I NEED to know how much of the soup (or whatever it is I am eating) I can eat to know my carb count for the day. Thank you for your kind consideratins. I still don’t see the serving size? I have the same NEED to know. Hi Glenda, the recipe shows serving size as 4 servings. I made this tonight and it was amazinggg! Question, can we make a batch and store it in the freezer? Yes, that would be a wonderful and tasty quick low-carb winter meal. There are natural sugars (but sugar nonetheless) from the cream, the mushroom and the spring onions. Libby, this soup is absolutely delicious! It’s rich, hearty and has a wonderful depth of flavour – one of those recipes which tastes as if it was far more complicated to make! And yet, it was so quick and easy. Far nicer than any tinned mushroom soup I’ve eaten. Thank you for your wonderful recipes – every one’s a winner.